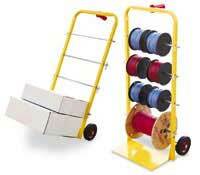 SpoolMaster reel carts offer simple spool storage and organization in a portable reel stand design. Each spool cart features sturdy steel construction with solid rubber tires for years of dependable performance in even the most demanding wire dispensing and management environments. The versatile SMP-HTC can be used as a vertical spool stand or hand truck, providing maximum efficiency with minimal impact on your budget.